The ocean abounds with a variety of water plants. These plants are often rich in nutrients, making them a primary food source to many marine animals. Some varieties of marine plants also help the environment by maintaining water clarity or preventing erosion on shorelines. Phytoplankton, algae, seagrass and mangroves are all types of marine plants that thrive in water environments throughout the world. Phytoplankton is a microscopic plant organism that grows in the ocean. Phytoplankton is generally green in color. There are several species of phytoplankton in a variety of shapes and sizes. Since the plant requires sunlight to survive, it generally thrives at or near the surface of the water. According to the National Aeronautics and Space Administration website, phytoplankton is the foundation of the marine food chain. Small fish as well as several species of whales eat phytoplankton as a primary food source. According to the California Environmental Resources Evaluation System website, algae is the oldest member of the plant kingdom. 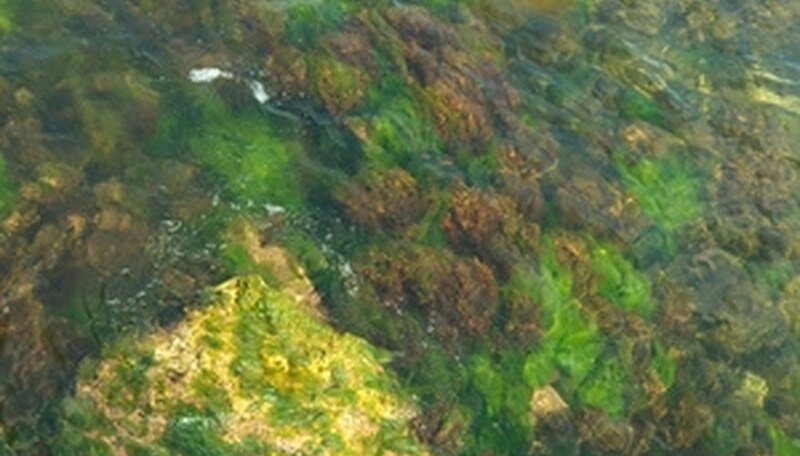 There are several varieties of algae. Certain types are microscopic in size, while others can grow as big as 100 feet long. Some common types of algae are the Turkish towel, rockweed, feather boa kelp and dead man's fingers. Seagrass is a type of marine flowering plant. There are about 52 species of seagrasses around the world, according to the Florida Department of Environmental Protection website. Like the phytoplankton plant, seagrass requires sunlight in order to survive. Therefore, it typically grows at or near the surface of the water. Seagrass serves as a food source for many marine animals. It also serves as a habitat and protection for small fishes, crustaceans and shellfish. Seagrass also helps keep the ocean water clean by trapping small sediments and particles in its leaves. Mangroves are shrub-like marine plants that thrive in the tropical and subtropical water regions of the world. Mangroves grow best in areas with a high content of saltwater. Many small marine animals create habitats in the roots and branches of mangroves. The plant is also a food source for some types of fishes, oysters and shrimp. Like the seagrass plant, mangroves also help protect the natural environment. According to the Lee County Government website, the mangroves' specialized root system can stabilize shorelines and help prevent erosion. NASA Earth Observatory: What are Phytoplankton?